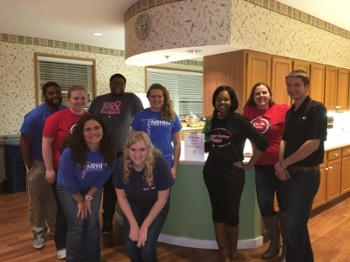 Southern Illinois University Edwardsville members of the National Residence Hall Honorary (NRHH) volunteered at the Ronald McDonald House in St. Louis on Saturday, Feb. 6. The volunteers prepared dinner and dessert for the guests of the house. Volunteers included Laura Minor, Quran Green, Courtney Gross, Kelsey Fark, Mitch Zurliene, Katie Krieshok, Marcus Powell, Stephanie Garriott, Frank Shadwell and Alyiah Butler, along with NRHH advisors McKenzie Whitaker and Alexis Paladini. The NRHH hosts several volunteer opportunities throughout the year. It is the recognition branch of the National Association of College and University Residence Halls (NACURH). Photo: NRHH volunteers (L-R front) Katie Krieshok, Stephanie Garriott, (back) Quran Green, Courtney Gross, Marcus Powell, Laura Minor, Aliyah Butler, Kelsey Fark and Frank Shadwell.